The proposal by the Chief Justice of India, R.M. Lodha has met with disparagement again, this time by his own colleagues. Lodha reportedly didn’t consult his colleagues in the apex court at all, before initiating the debate about keeping the courts open throughout the year. Judges of the Supreme Court are feeling ignored that the issue was never mooted in any of their meetings, and stated that, "Probably, we could have told the CJI how unworkable the proposal is. Also, we could have given suggestions to improve the pace of the justice delivery system". Justice Lodha, while addressing the legal fraternity in Jodhpur at the foundation-stone laying ceremony of a Bar Council of Rajasthan building, drew parallels between the justice delivery system and other requisite services like the medical & health facilities, stating that, “Law and justice field has its dignity and it must be maintained in order to keep the trust of the people in judicial system”. The proposal had been rejected by the lawyer community in a meeting of the heads of various state bar councils. The suggestion was rejected with the Chairman stating, “It is not possible for advocates to attend court for all 365 days. It is neither practical nor feasible for an advocate to work throughout the year without rest.” The committee started getting critical of the CJI, who has a very short tenure of five months. 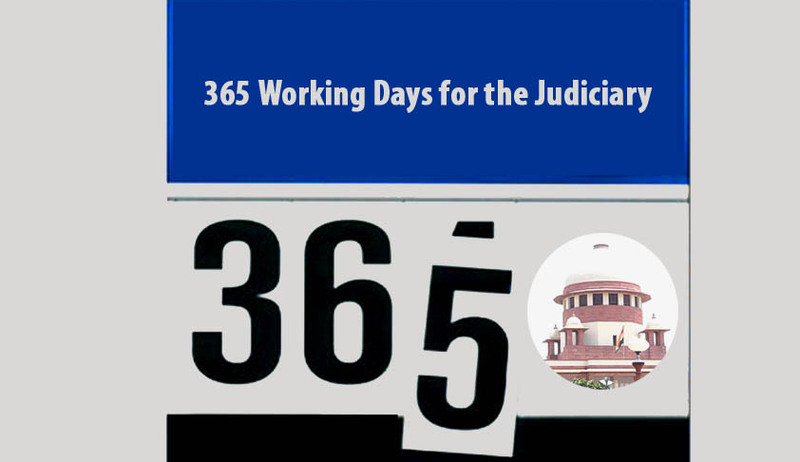 The BCI instead suggested extension of the working days and hours of the courts to maybe 210 days instead of 365 and stated that this will also be enough to reduce the backlog of cases. Live Law had reported that the legal fraternity in Mumbai and Kerala had opposed the idea since its inception. However, with this verdict by the state bar councils, the implementation seems far from execution. The Supreme Court Bar Association had also rejected the suggestion, after stating that the Supreme Court collegium must fill the large number of vacant judicial posts. But the association added that “if necessary, working hours of all courts may be increased by one hour on all working days for sometime as an experiment in order to see if disposal of matters increases and, if it does, then this may be done for a year or so till the arrears are reduced”. This suggestion was put forward in order to relieve the courts from the huge number of backlogs plaguing the courts. However, the idea has seen opposition from all sectors now. The increase in the number of days could’ve increased the efficiency of the judicial system by 26%. However, the discourse now seems to have reached a dead end, with no one keen on accepting Lodha’s viewpoint. Read more news about CJI Lodha’s proposal here.